Although fire officials said PG&E is not to blame for the 2017 Tubbs Fire that took 22 lives, the cause of the 2018 Camp Fire that killed 86 people is still under investigation. Approximately 50 complaints have been filed against the company on behalf of more than 2,000 plaintiffs related to the Camp Fire, and PG&E doesn't have the insurance to cover the claims, the company said in an SEC filing. PG&E was also found responsible for a series of other fires that tore through Northern California wine country in 2017. By declaring bankruptcy, those cases are less likely to go to trial before a potentially sympathetic jury and the amount the company might have to pay would be limited to their resources at hand. "The reason this case is filed is to stop the company from being eaten alive," said Scott McNutt, a bankruptcy attorney who teaches at the University of California, Davis School of Law. IS THIS A GLIMPSE AT THE FINANCIAL TOLL OF CLIMATE CHANGE? Projects such as moving power lines underground to prevent wildfires are extremely costly, and could be a drag on companies' finances, raising costs for customers and reducing the value of shareholders' stocks. John MacWilliams, a fellow at Columbia University's Center on Global Energy Policy, called it a test case for how utilities and other major infrastructure players deal with climate change, who is responsible and who is accountable. "This is the type of thing we're going to see a lot more, unfortunately, because of climate change," MacWilliams said. WHAT ROLE DOES PG&E PLAY IN CALIFORNIA'S GOAL TO USE 100 PERCENT RENEWABLE ENERGY BY 2045? 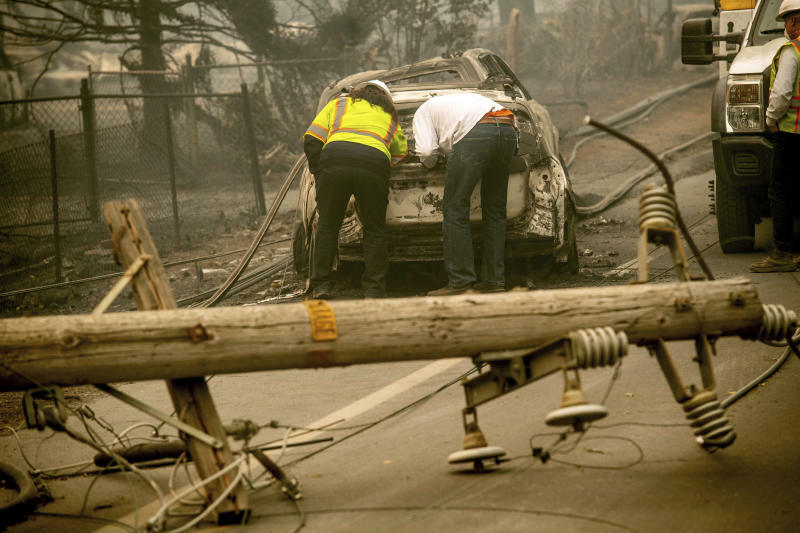 Some worry that PG&E's contracts with providers such as solar companies could be renegotiated under less favorable terms because of the bankruptcy negotiations, but it's unclear whether that will be the case. "The more money that is spent on bankruptcy filings, on courts, on damages, on issues related to this horrible tragedy, the less money there is to invest in renewables, and the less money there is to invest in the infrastructure for those renewables," said Detlef Hallermann, a visiting professor of finance and energy markets at San Diego State University. WHY WASN'T A POSITIVE FIRE REPORT ENOUGH TO STOP THE BANKRUPTCY? PG&E said Tuesday that in deciding to declare bankruptcy, it had already taken into account its longstanding belief that the company did not start the 2017 Tubbs Fire. "The company was between a rock and a hard place when it came to trying to continue its operations much beyond this fall," said Travis Miller, a strategist at Morningstar, Inc.